The Peregrine falcon can reach speeds over 200 mph (320 km/h) in a dive, making it the fastest creature on the planet. In 2005, a falcon was recorded at a top speed of 242 mph (389 km/h). The air pressure from a 200 mph (320 km/h) dive could possibly damage a bird’s lungs, but small bony tubercles on a falcon’s nostrils guide the powerful airflow away from the nostrils, enabling the bird to breathe more easily while diving by reducing the change in air pressure. You can barely see them in this photo. My uninformed identification of this chick’s subspecies is Falco peregrinus anatum, also known as the “American Peregrine Falcon” and the “Duck Hawk.” Its scientific name means “Duck Peregrine Falcon.” The anatum can be found in most parts of the U.S. and Canada. Today the American Peregrine falcon is found mainly in the Rocky Mountains. It was formerly common throughout North America between the tundra and northern Mexico, where current reintroduction efforts seek to restore the population. As is common with bird-eating raptors, the female is much bigger than the male. The male Peregrine weighs about 500 to 570 grams (1.1–1.3 pounds), while the female weighs about 900 to 960 grams (2.0–2.1 pounds). The life span in the wild is up to 15.5 years. Mortality in the first year is between 59–70%, declining to between 25–32% in adults. The Handbook of the Birds of the World lists 19 subspecies of Peregrine falcon. They can be found nearly everywhere on Earth, except extreme polar regions, very high mountains, and most tropical rainforests. The only major ice-free landmass from which it is entirely absent is New Zealand. This makes it the world’s most widespread bird of prey. Both the English and scientific names of this species mean “wandering falcon,” referring to the migratory habits of many northern populations. The Peregrine Falcon hunts at dawn and dusk, when prey are most active. The eat mostly medium-sized birds like doves, waterfowl, songbirds, waders and pigeons. Worldwide, it is estimated that between 1,500 and 2,000 bird species (up to roughly a fifth of the world’s bird species) are predated by these falcons. While its diet consists almost exclusively of medium-sized birds, the Peregrine will occasionally hunt small mammals, small reptiles or even insects. To protect their eyes, the falcons use their nictitating membranes (third eyelids) to spread tears and clear debris from their eyes while maintaining vision. Prey is struck and captured in mid-air; the Peregrine falcon strikes its prey with a clenched foot, stunning or killing it, then turns to catch it in mid-air. The Peregrine will drop it to the ground and eat it there if it is too heavy to carry. Prey is plucked before consumption. It reaches sexual maturity at one year, and mates for life. It nests in a scrape, normally on cliff edges or, in recent times, on tall human-made structures. This one was found on the 10th floor of a building in downtown Davenport, Iowa. The Peregrine Falcon became an endangered species in many areas due to the use of pesticides, especially DDT. Since the ban on DDT from the beginning of the 1970s onwards, the populations recovered, supported by large scale protection of nesting places and releases to the wild. The Peregrine falcon was used in falconry for more than 3,000 years, beginning with nomads in central Asia. Due to its ability to dive at high speeds, it was highly sought-after and generally used by experienced falconers. Peregrine falcons are occasionally used to scare away birds at airports, improving air-traffic safety by reducing the risk of bird-plane strikes. Peregrines were used to intercept homing pigeons during World War II. The Latin term for falcon, falco, is related to falx, the Latin word meaning sickle, in reference to the silhouette of the falcon’s long, pointed wings in flight. A Peregrine falcon is prominently featured on the Idaho quarter issued in 2007 as part of the United States Mint’s 50 State Quarters program. The Suzuki Hayabusa motorcycle — the company’s fastest production model — is named after the Peregrine falcon with hayabusa being the Japanese word for the Peregrine falcon. 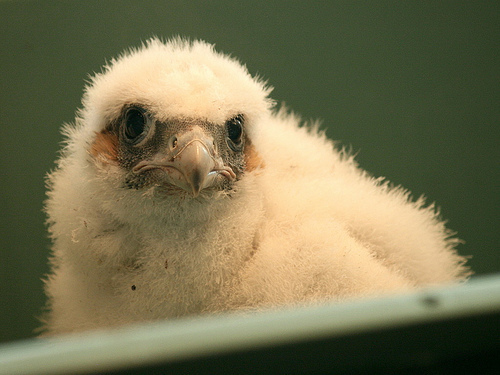 The Peregrine Falcon was removed from the U.S. Endangered Species list on August 25, 1999. 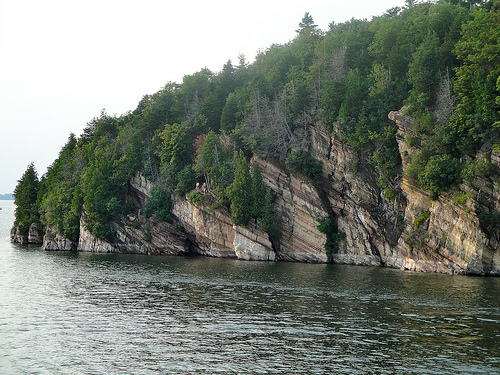 Some kids were cliff-diving off of these.